At the Washougal 500 National, Yamaha's Mike "Too Tall" Bell won the overall over local hero Chuck Sun of Team Honda, going 4-1 to Sun's 1-4. Finishing third was Goat Breker aboard a factory Kawasaki. The Washougal wins turned out to be the last outdoor overall of Bell's career. In the 125 Class, Kawasaki's Jeff Ward topped the veteran Bob Hannah on a Yamaha, as well as Honda riders Jim Gibson and Brian Myerscough. It was only the second win of Ward's stellar young career. 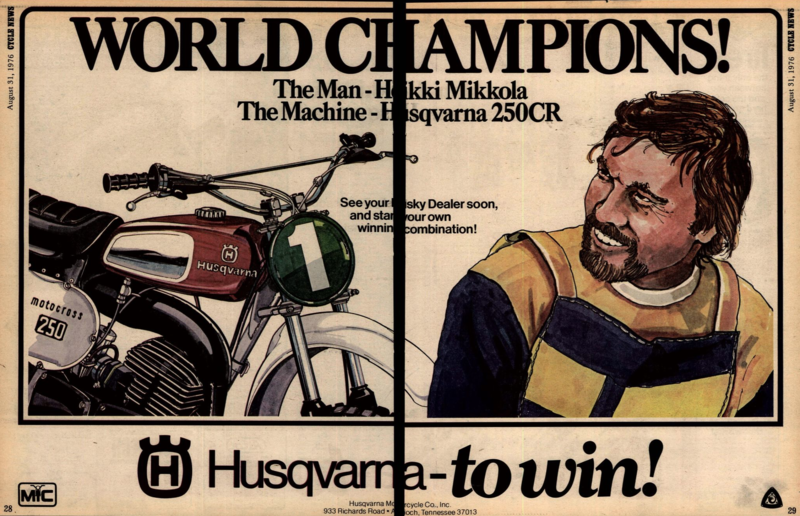 But the bigger news happened over in Luxembourg at the final round of the 1982 FIM 500cc Motocross World Championship. Suzuki's Brad Lackey completed his ten-year crusade to become America's first Motocross World Champion by finishing 2-3 at Ettlebruck aboard his Stig Petersen-tuned RN-82 works bike to clinch the title from his teammate, Belgium's Andre Vromans. It marked the first time a U.S. rider was ranked #1 in the world, beating Danny LaPorte to that epic milestone by just three weeks. Yamaha's future 500cc World Champion Hakan Carlqvist would win the overall after Vromans blew his chances when he forgot a first-lap detour right off the start and began climbing a hill that was used on every lap but the first. By the time he realized his mistake and got back with the pack, he was in 17th place. Incredibly, Graham Noyce—the very same Graham Noyce knocked off his bike by a spectator back in 1976—got hit in the hand by a spectator wielding a stake used to rope off the course, breaking a bone in Noyce's hand. It was reported that the spectator was angry with Noyce for having allowed Lackey to pass in next-door Belgium the week before and then winning the second moto from Vromans, harming the Belgian hero's chances to overtake Lackey in points. Lackey also reported having debris thrown at him. Ironically, Suzuki and Lackey would part ways after the season, as the brand was slowly but surely getting out of Open class racing. 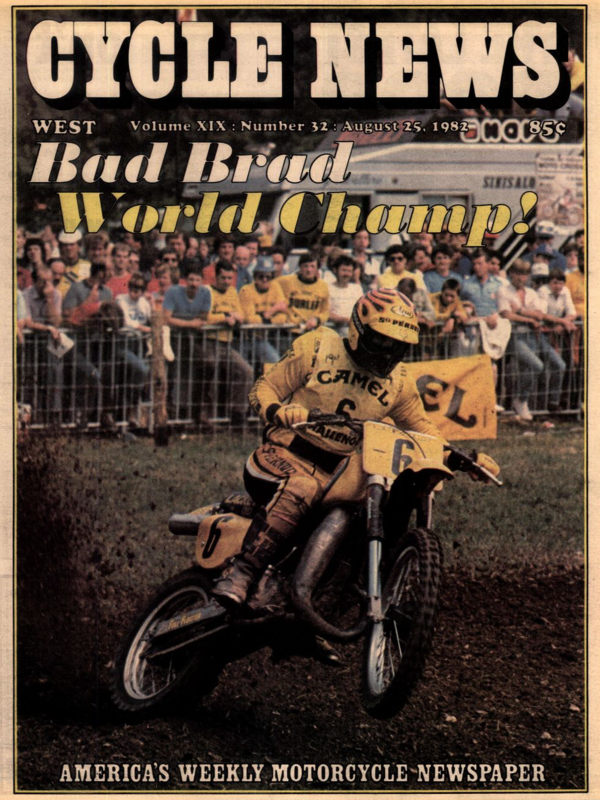 He would race just one more time as a professional, riding a Yamaha and wearing the long-coveted #1 plate at the '83 Carlsbad U.S. Grand Prix, going 5-6 in the two motos. 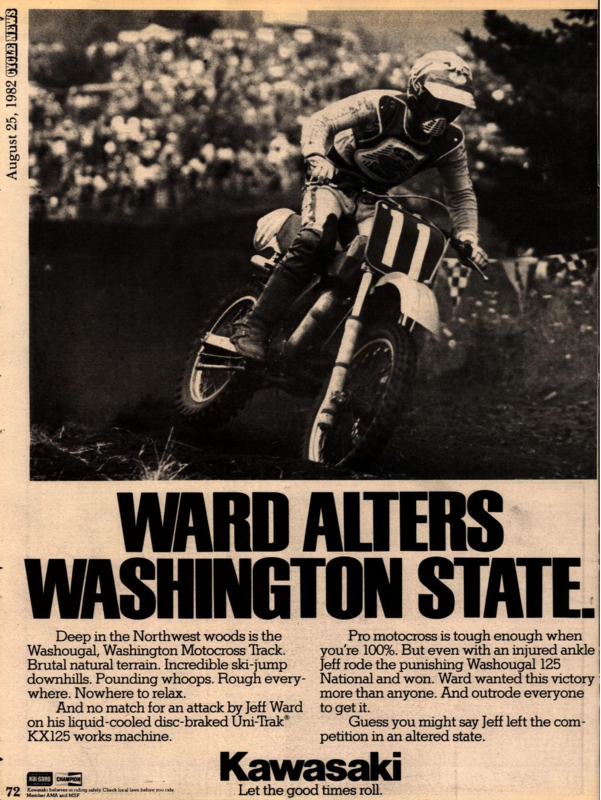 On his way to what would be the last AMA 500cc Motocross Championship, Kawasaki's Mike LaRocco went 1-1 at Washougal to top the 2-2 of Honda's Jeff Stanton and the 3-3 of Stanton's teammate Steve Lamson. In the 125 Class, Yamaha's Jeff Emig, the defending 125 National #1, bettered Suzuki's Ezra Lusk and Honda's Jeremy McGrath, the '93 AMA Supercross Champion.